•Free Admission for UTEP Students with ID Registration Information: Name: _____________________________________________ Address: ___________________________________________ ___________________________________________ Employment: _______________________________________ Profession: ________________ CEUs _____YES _____ NO Phone: _____________________________________________ E-mail: _____________________________________________ (Required) Send Payment and Mail Registration to: UMC-Trauma SANE Service Attn: Carmen Hernandez 4815 Alameda Ave. El Paso, Texas 79905 (915)521-7556 Email Registration to: carmenhernandez@umcelpaso.org Conference is limited to 200 participants. Advance registration is required to guarantee a seat. Walk-in registrations will depend on availability of space & prior approval. Administrative Services Center, Bldg A. Registration live on the IAFN website under the “Chapter Conference” tab. 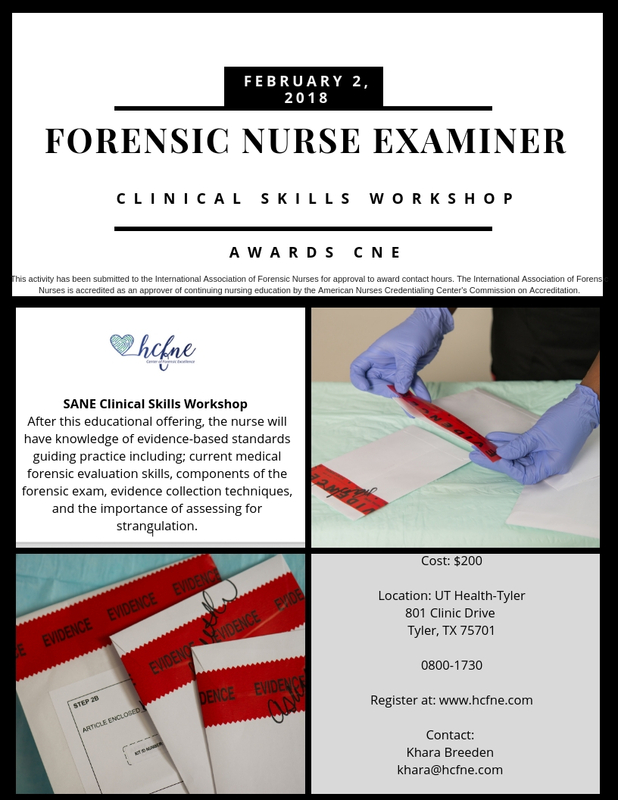 Texas A&M University, College of Nursing, Forensic Nursing Program is collaborating with the Texas Attorney General's Office to update the Texas Evidence Collection Protocol, which is now in final review. Our next step is to hold town hall meetings regionally throughout Texas with the goal of receiving stakeholder feedback on the contents of the SAEK and the accompanying paperwork, based on the recent edits to the protocol. Space is limited. Please only register for and attend one town hall meeting to allow access for others, as many sites have limited space. Please share with your SART, emergency department and medical director and others who provide care to those who have experienced sexual assault. If you have any questions, please contact Laurie Charlescharles@tamhsc.edu or Stacey Mitchellsamitchell@tamhsc.edu. Texas Tech University Health Science, 4800 Alberta Ave. Auditorium B on the second floor. You are cordially invited to attend the Texas SANE Coordinator’s Forum January 7-8, 2019 at Texas A&M University in Round Rock. SANE Coordinators and SANE Program Medical Directors are welcome to attend. The meeting will be held at 3950 N. A.W. Grimes Blvd, Round Rock, 78665 in room S100 from 8:00AM to 5:30PM on Monday and from 8:00AM to 11:30AM on Tuesday. Since we have a limited time together, and have much to cover, we are ordering in continental breakfasts for both mornings and lunch on January 7, 2018. The $20 charge is to cover continental breakfast and lunch. There is no promo code. Registration for the SANE Coordinator’s conference is at no cost to you and your medical director. Please find the agenda attached here. This is immediately following the SANE Coordinator’s Forum. If you are unable to attend the Round Rock Town Hall, or you would like to attend a Town Hall in your own region, please register for that Town Hall. The Texas SANE Education Course-Adult/Adolescent will be held November 14-18, 2018 at the Texas A&M University Round Rock Campus in Round Rock, Texas. The cost is free to Texas RN’s. Participants must be a RN with a minimum of 2 years of experience. This is an in-person course. We will send more information in the confirmation packet. Deadline for registration is October 30. For questions, anyone may contact me at 979-436-0283.